Dental health declines with the progression of time and age. Seniors are more likely to experience the need for various dental services due to the lack of proper oral health care. Gum disease-redness and swelling of gums, a recession of gums, infections, and jaw bone deterioration. Tooth loss-sometimes due to infection or wearing away of tooth surface and decay. Decreased sense of taste-due to wearing dentures, medications, and disease. Root decay-due to thinning of tooth enamel, a recession of gums and disease. Darker teeth-loss of tooth enamel & bone dentin makes the tooth more susceptible to stains from food and drink. Arthritis or similar medical condition- limits manual dexterity. Oral cancer - Watch for white or red bumps or sores in your mouth. Crusting dentures; debris can build up on dentures causing aspiration into the lungs. This, in turn, can lead to inflammation or pneumonia. Clean dentures daily. Dry mouth- when saliva is reduced more bacteria sets up in the mouth. Gums growing over teeth. This can be the side effect of some medications and should be brought to doctor's attention. Other Symptoms which can affect dental health: tooth sensitivity, teeth grinding, pain, swelling, loose teeth, jaw popping or clicking, difficulty quenching thirst, swallowing or chewing. Oral examinations by a dentist should be conducted annually or more often if there are existing factors; brushing at least twice a day reduces bacteria which can lead to dental problems. Problems of the teeth should not be ignored or left untreated for too long, particularly infections. Remember that the teeth are located in the head region and can create serious health issues when left untreated. Evidence has shown that oral disease contributes significantly to diseases of the heart, thyroid, diabetes, and cancer; therefore it is important to have good dental health. Prevention through proper oral care and check-ups is the key to good dental health. According to the Mayo Clinic, approximately 70% of those 65 years of age or older are in some stage of periodontal disease which affects the gums and bones surrounding the teeth. Depending on their state of being someone should check behind the senior for problems and not leave checking to the senior alone. Complications can be avoided if caught in time. If the gums are puffy, red and or bleeding an appointment should be sought right away. The present theory is that bacteria in infected gums can be dislodged through brushing, flossing, rinsing or chewing and move throughout the body's bloodstream. Over time hindered blood flow can lead to a heart attack or stroke. The rather important point here is to not ignore these signs or conditions. Protect your smile, because it is an asset you want to carry with you at all times. Should you wear dentures make sure they fit properly so that you may be able to taste and enjoy the food you eat. Proper fit, cleanliness, and wearing of dentures will prevent that sunken look your face acquires without them. You always want to look your best and present a good picture of health. Preferred Provider Organization- Good coverage with more flexibility in the selection of doctors. Is the most expensive of the various plans. PPO’s are managed care organizations which allow you the member to select from a network of dentists for services. You may select outside of the network but services may cost more. Also with this plan, there is a deductible (upfront charge for the year) which has to be paid as well. Health Maintenance Organization-This plan is similar to the PPO but is usually lower in cost. Members are assigned a doctor and the doctor is paid by the provider based upon the number of patients treated within a certain time frame. Time and attention given to patients are less because the numbers providers are expected to produce. Discount Dental Plan- Is not an insurance plan, but is more of a fee for services. To become a member there is a small monthly charge, the patient pays the doctor, services are rendered at an agreed upon discounted rate, there is no waiting period, nor claims to be filed. Patients often choose this alternative to supplement their Medicare or major insurance plan. Traditional Dental Insurance-the plan pays for 50-80% of costs for services, a patient is able to choose any doctor and pays the doctor directly, but is later reimbursed according to plan. This plan is more expensive for seniors on fixed incomes. Should you not be eligible for Medicaid or insurance you might check with your local health dept, hospital, dental or hygienist school, American Dental Association or clinics in your community for services. Some community agencies offer discounts on services to the elderly. Also, check with your local department of human services; in some communities, you have to be referred to them to get assistance. Clinical trials are another resource to check into for procedures at a much lower rate, but there may be qualifications you must meet. Check with www.clinicaltrials.gov to see if there are any near you. Prevention and maintaining oral health are key dental issues in keeping healthy teeth. Losing your teeth does NOT have to be an eventual occurrence. Because populations are living longer, research shows that more people are keeping their natural teeth. People are able to do this by developing a daily regimen of brushing, flossing, maintaining a healthy diet, eliminating or limiting tobacco products. Plaque can build up quickly on the teeth of seniors, especially if oral hygiene is neglected. Some seniors may even require help-either from family members or from staff if they are in a nursing home setting. Remember to use a toothbrush that has soft bristles or an electric toothbrush. Visit your dentist for check-ups and cleanings; they are necessary for prevention. 1. Dry Mouth-lack of sufficient saliva in the mouth is a common condition in seniors that may be caused by medications or certain medical disorders. 2. Medications-prescribed or over the counter drugs used to improve health. 3. Tooth Decay/ Cavities-on the root surfaces of the teeth are more common in older adults. 4. Poor Nutrition-lack of vitamin and mineral rich foods which fuel the body. 5. Periodontal Disease-infection of the gums which causes the gums to swell and/or bleed. 6. Darkened Teeth- from thinning enamel and prolonged use of stain-causing foods and beverages. 7. Sensitivity- over time your gums recede, leaving areas of the tooth unprotected by its enamel. Thus areas are prone to pain due to cold or hot air, foods or beverages. The good news is that there are practical ways to combat these risks! 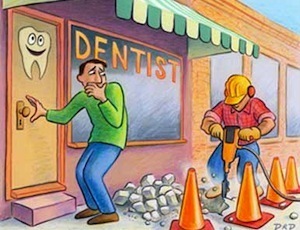 Visit your dentist regularly for a complete dental check-up. Unfortunately, with seniors, dental issues are often ignored due to the lack of pain. Intercepting dental problems early can lead to oral health treatment that is less invasive, less painful, less expensive, and often with seniors, associated with less risk. Filling- is a procedure used to restore a damaged tooth by decay back to its normal function and shape. The Dentist first removes the decayed tooth material, cleans the affected area, and then fills the cleaned out the cavity with a filling material. Crown- is a tooth-shaped cover placed over a tooth that is badly damaged or decayed. A crown is made to look like the tooth, sometimes called a cap. 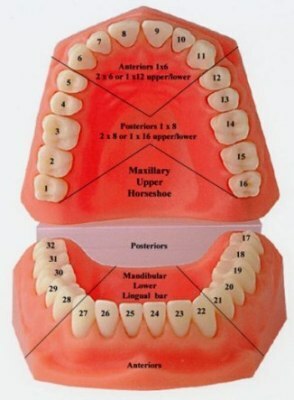 Bridge/Partial- fixed to selected teeth but a removable denture made to replace one or more missing teeth. Root Canal-procedure where the nerve and tooth pulp is removed from a badly decayed and painful tooth. Dentures/False Teeth- full mouth replacement for missing teeth that can be taken out and put back into the mouth. Dental Implants-are small metal pieces placed in the jawbone to hold false teeth or partial dentures in place. Your gums must be healthy and your jawbone able to support the implants. Be sure to let your dentist know of any general health issues you're facing and any changes in your condition or medications. Taking care of your teeth can help them last a lifetime. Here’s to many more years with your beautiful smile! Many people are exploring the benefits of the dental implant procedure as a way around bridges and dentures to preserve their smile and provide a more permanent seating of their teeth. Implants provide a more stable support for artificial teeth, with no need to utilize adjacent teeth as well as allow for less of the sunken look of the face as seen with dentures. The procedure was first invented by an Orthopedic Surgeon, Dr. Per Ingvar Branemark of Sweden. He discovered but had a difficult time convincing the medical community that titanium could fuse to a bone. After many trials, the Sweden National Board of Health and Welfare approved Dr. Branemark's implant procedure in 1970. His procedure was globally studied and practiced. What exactly is involved in the dental implant procedure? Dental implants are artificial tooth roots that provide a permanent base for fixed, replacement teeth. Because they have a solid fit, they feel and function more like natural teeth. Dental implants are especially good for people who suffer from missing teeth, damaged teeth or chronic dental problems. To remedy the above problems allows one to develop a more healthy diet. Sore spots, lack of or broken teeth simply does not permit one to chew and digest food properly. To be a good candidate for the dental implant procedure, you must have healthy gums and bones to mount the posts in the jawbone. Reasons for having the dental implant procedure include: Missing teeth lead to gaps. Dental implant procedure: The procedure can take place in one day or over a period of time, depending on how many teeth are being replaced and your dentist's treatment plan. More than anything one should be in good health to assure proper healing. Consultation-meet with staff for education and screening. CT scans, x-rays and prophies (models of mouth) will be done to give the dentist a picture of issues and problems to assist in developing your personal treatment plan. Financial terms and information are disbursed and how this will be handled. You will be scheduled for a follow-up consultation to discuss your treatment plan which your dentist has developed and its' cost. Implant Placement-there are three parts of the implant. The initial is a post/screw which is surgically placed into the jawbone to act and replace the root portion of your tooth or teeth. It is made of titanium metal which bonds to the bone site of the mouth and prevents bone loss. The second part is the abutment, the connector which attaches to the post or screw to firmly hold the tooth or teeth in place. The third part of the dental implant procedure is the crown, the actual prosthetic tooth. Implants can be a single tooth, or several depending on your need and treatment plan. A temporary crown is usually seated until the permanent one is ready. Healing Process -this step may require up to six months to allow for the bonding and healing of the site to take place. Your dentist will prescribe medication to deal with swelling and minimize infection. You may also have to maintain a soft food diet for a short while. Follow instructions precisely to promote the healing. Placement of permanent prosthesis-there will still be frequent visits to check the site(s). It is imperative to keep your follow-up appointments to prevent any problems. After proper healing, the permanent prosthesis is seated. The procedure is usually not covered by insurance companies and if so they only cover about 10% of the cost. The implant procedure is a lot more expensive than most dental procedures. An average cost of $2,000 for one tooth. Some practices carry payment plans, but they are not cheap. Like with other forms of dental treatment there will be some discomfort, but your dentist will give you pain medication to help you through this. Implants last a lifetime with good oral hygiene.Good oral hygiene also prevents infections. As the procedure becomes more popular the cost may decrease. Only you can determine whether "it's worth it" for you.